I have a high stress life. I am currently working full time, going to college full time, doing an internship at a local school, running this website and doing a few other social media jobs. I am SUPER busy. I also work nights and sleep during the day which can be difficult to do. Since I have had so much on my plate recently, I have been having a hard time sleeping. I lay awake thinking about deadlines and everything that has to be done. When I heard about the Karmick Hot Cold Eye Mask I knew that it could help me. Plus, it has one of my favorite scents: Lavender. This Karmick eye mask can be used hot or cold by placing it in the microwave or freezer. I personally like to keep it in the fridge. It can also be used as a hot/cold pack to relieve muscle pain which is also useful to me. 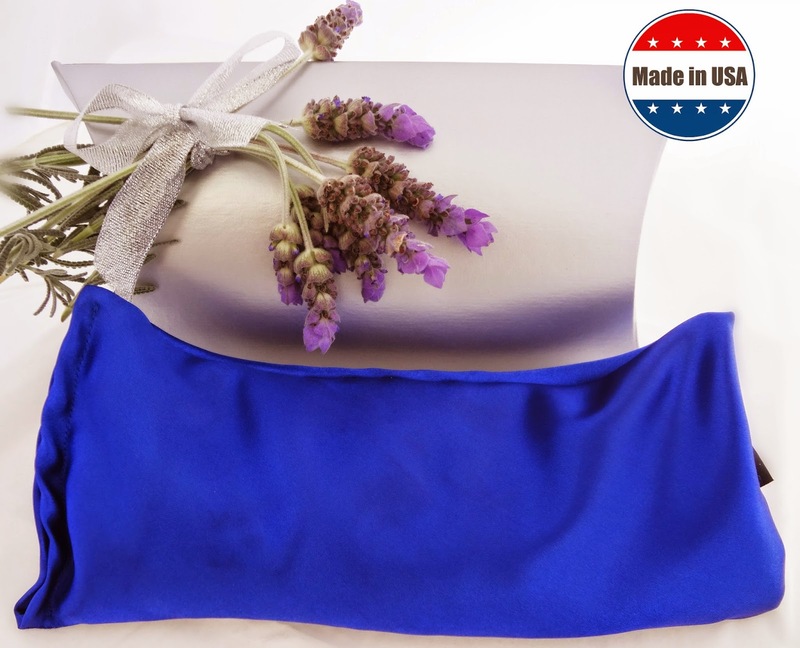 Karmick Eye Masks are made individually in the USA and they contain all natural ingredients. The outside is a gorgeous blue silky satin. I have used this Karmick eye pillow in every way possible at this point and I love it. I have used it as a calming heating pack for my sore neck and back, I have used it warm and cold on my eyes. As I mentioned earlier, I have even discovered that I like keeping it in the fridge. My freezer has some issues and often leaves ice crystals on anything left in there, so I put it in the refrigerator. It stays cool for a really long time and it is SO calming and relaxing on your eyes. When you microwave the mask, you can only microwave it for a short time. As a result, it doesn't stay warm for very long. That is the only complaint I have about this mask. It is much better cold anyhow. The mask has a very distinctive, but not overpowering lavender smell that is amazing. I have been using the mask for a few weeks and it has not lost potency at all. I believe that there is lavender essential oil mixed inside the mask. I am not sure exactly what the natural ingredients are that are inside the eye mask, but they are very small and fine. It allows the mask to conform perfectly to your face. The outside material is satin and feels amazing on your skin. Not only is the lavender scent and cool satin relaxing, but this eye mask truly does block out all of the light in the room too. As someone who sleeps during the day, I love this benefit. I definitely recommend this Karmick Eye Mask. It is by far the best eye mask that I have owned and it doubles as a small heating pad or cool pack. It would also make a great Christmas gift! 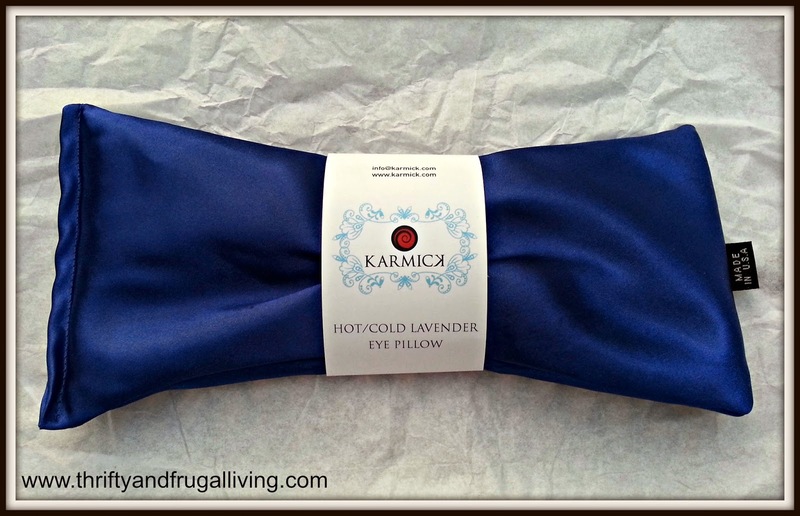 One lucky Thrifty and Frugal Living reader will win a Karmick Hot Cold Lavender Eye Mask! **TO ENTER- Enter using the Rafflecopter below. Note: It may take a moment for the Rafflecopter to load. If you are reading this via RSS or Email, please visit the website to enter** Ends 11/24 at 11:59pm. Wow! You really are a busy lady. This sounds like it would be great for itchy allergy eyes too! This sounds fantastic for restorative yoga! I would love this for my afternoon nap. I would love to win this since I've been having trouble sleeping since I've been pregnant! I love lavender...it's so soothing! I sleep with my eyes open a little bit and my eyes hurt when I wake up. Hoping this might help. After á long say of work, I could use this as a stress reliever. I'd like to have this to help me relax before bed. I want to win this for my itchy , allergy eyes. I want to win because I have used eye masks at the yoga studio and they are so relaxing. I would love to own one! I love the smell of lavender and have a lot of sinus headaches. I hope this would help me. This would be perfect for the nights when I have a hard time falling asleep. I would love to try something new. I would like this for naps. I want to win it because I don't like the traditional eye masks.